A middle-aged woman said to have plunged from an upper deck of a giant cruise ship, crashing to her death on a lifeboat, was reportedly struggling with a “muscular” man seen choking her before the fall. That’s the news story carried by website Diario on the Caribbean island of Aruba. 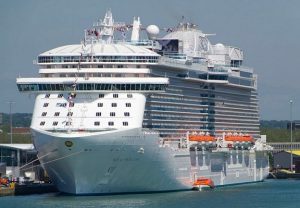 The report followed the mysterious death of an American woman on the ship Royal Princess while the 19-deck ship was sailing between the islands of Curacao and Aruba. Caribbean news outlets including Mas Noticia say a murder investigation is underway. In a brief statement sent to USA Today late last week, Princess Cruises confirmed that a 52-year-old American woman died on Royal Princess early Tuesday as it was sailing to Aruba. 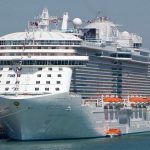 The Miami Herald reports a cryptic post on cruise community website Cruise Critic.com by a passenger apparently aboard Royal Princess, which returned to Fort Lauderdale on Saturday after a seven-day Southern Caribbean cruise. The cruiser said that when the 3600-passenger ship docked in Aruba, the captain announced there had been “a serious incident and no one could leave as local authorities were coming onboard”. The Associated Press has since reported that the FBI and Aruban authorities are investigating the woman’s death. In a brief wrap-up of similar cases, Jim Walker’s Cruise Law News notes that in July last year, the FBI arrested the husband of a 39-year-old woman who was murdered aboard Emerald Princess operated by Princess Cruises in Alaska.